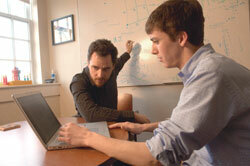 Tim Chartier, Ph.D. collaborates with Erich Kreutzer, class of 2010, on research in numerical linear algebra at Davidson College. Tim is a member of the 2002 Project NExT cohort. The Second Century Campaign is a comprehensive effort to support MAA’s vision and priorities. This five-year, $7 million philanthropic drive was publicly launched at MathFest in Portland, Oregon on August 8, 2014. MAA Project NExT has, since 1994, welcomed more than 1,500 new faculty, providing guidance on the full range of academic responsibilities and a network of peers and mentors that help sustain them in their new roles. With your support, we can expand the reach and effectiveness of Project NExT. MAA American Mathematics Competitions reach more than 350,000 middle- and high-school students each year, engaging students in solving high-quality problems developed by members. The new MAA Curriculum Inspirations project provides free video and print materials, based on AMC content, to help teachers and students develop high-level mathematical skills, all cross-referenced to the Common Core State Standards in Mathematics. A gift to support MAA AMC will help us continue to develop Curriculum Inspirations and reach more students, building mathematical capacity at all levels. MAA Press offer the highest-quality mathematical exposition, keeping members informed of the full range of activity in the mathematical sciences. MAA textbooks are reviewed, edited, and approved by MAA members. We strive to offer high-quality, innovative texts at a price well below those of commercial publishers. Your gift to the GMAA Fund will help sustain MAA publications. MAA Meetings provide opportunities to learn new mathematics, find new ideas for teaching your courses, and reconnect with friends and colleagues from around the world. Sessions for students engage and inspire the next generation of leaders. Your gift to the GMAA Fund will help us continue to support student participation at MAA meetings – and of course we hope you will plan to attend those meetings in 2015. To contact the Development Office, please call MAA Executive Office, at 202-319-8465.